Alloy Wheels can add to the overall appearance of a car, but if they become kerbed, scratched, chipped or corroded, then they quickly stand out. 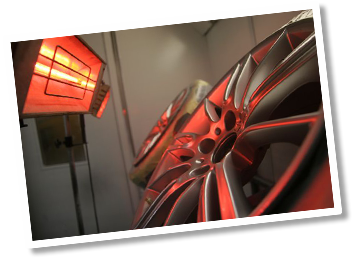 At Dentfix we are uniquely able to provide a full service repair for alloy wheel rims. Whatever kind of Alloy Wheel Refurbishment you require - If you have scuffed, scratched or kerbed your wheels, or they have become discoloured or corroded - the Alloy Wheel Refurbishment system that is used by our technicians can repair and restore your wheel rims and match their original colour and finish or you may like a colour change. As with most of our other services, Alloy Wheel Repair can be carried out at our Repair Centre in a day. "Just a quick note to say thanks for the great job you did on my TT alloy wheels, will come back again when the new ones are scuffed!! Cheers"